If you want to find out why the Danes are often called “the happiest people in the world”, this compilation CD from Bamses Venner provides a very good starting place. Laid back pop music, with a twist of rock`n roll, reggae and buggy rock are the trademarks of Bamses Venner, and has been since the band was formed in Aarhus, the second largest city in Denmark, way back in the early 1970`s. 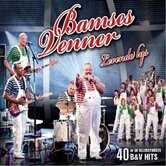 This compilation gives you a very nice selection of hits taken from the 25 albums released by Bamses Venner, who first hit the charts in 1973 with the single Blodtud, a song about a boy only having three teeth left after kissing another mans wife. Also included is the bands ESC entry from 1980, Tænker Altid På Dig, and it ends with the 2009 TV talent show winning song Levende Lys. Bamses Venner didn’t not participate in the show themselves, but band leader Flemming Jørgensen led a chorus of amateur singers to victory in the final over another former Eurovision Song Contest participant, Mike Tramp, from Mabel, who sang Boom Boom in the 1978 contest. On this 2 CD compilation, you’ll find Danish versions of international hits like: Living Next Door To Alice, Teddy Bear, Baby Come Back and many more, track them yourself as you listen along to the album. At the beginning of Bamses Venners career, the songs often had a funny angle in the translations, this developed over the years into more “serious translations”. The band soon started to write their own material, or got others to write for them, people like Kim Larsen, who took part in the Danish final in 1980 with the song Ud i Det Blå, and Niels Drewsholt, who wrote both music and lyrics to the Danish 2006 entry in Athens, Twist Of Love. One of the songs on the album, Wimmersvej has a funny story to it. On cd1, you hear the original Bamses Venner version, but after some controversy about who really own the rights to the song, Ntsele or George Weis, Flemming Jørgens made and updated version, using South African composer Solamon Ntsele`s 1939 version as background, and donating the royalties to the three daughters of Ntsele. Bamses Venner has always been a non political band, but from time to time they they comment on topics in this country, like in the song Volleborg where the give support to the often yelled at weathermen because of their not always correct weather reports. In the song Klip i Mit Kørekort they reflect over the newly introduced driving rules, a bit like George Harrisons bitter/funny feelings towards the British tax rules in the Beatles song Taxman. Before CO2 became the new political topic, Bamses Venner created the song Sammen Vender Vi Strømmen, in a joint effort with Danish electricity companies, to reduce CO2 for a better environment. Take that Al Core! To round up it all, yes indeed, this is a very Danish album. But even though you don’t understand our language, or the sense of humour we use, it’s worth listening to. Bamses Venner really knows how to make one feel good, so if you buy it, relax, lean back and let your hair down. ← De Toppers after Moscow: Gerard Joling to replace Gordon?